Let’s make metering smart again! That’s the progress that has been made against the target for rolling out second generation smart meters (“SMETS2”) as highlighted in a damming NAO report this morning (www.theguardian.com/environment/2018/nov/23/smart-meters-rollout-labelled-a-fiasco-as-consumers-face-extra-500m-bill). The report goes on to say that as result of a series of failures in the roll-out programme the government’s 2020 completion target is “in tatters” and consumers will be faced with additional costs – added to their energy bills – of over £500m. The technical and logistical problems of installing equipment in 30 million homes and business premises are obviously immense (even without the functionality problems many disgruntled consumers have experienced), but there’s a customer engagement challenge, too. No consumers are obliged to have smart meters installed, but the energy companies and installers are under government and regulator (Ofgem) pressure to meet targets. User research indicates there are direct, financial benefits to the use of smart meters, especially the second generation variety, but the industry clearly hasn’t done all it can to persuade consumers of those benefits. 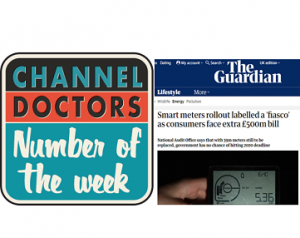 Public awareness of smart metering is incredibly high (98% according to Smart Energy GB www.smartenergygb.org), but spontaneous consumer demand is low. This suggests that old fashioned direct interaction and proactive contact have a vital part to play – be that face-to-face, via digital channels or voice. Whatever the customer engagement mix, contact centres will be crucial. Energy supply and metering are esoteric areas, but customer engagement shouldn’t be.